I've fallen in love with my evergreen Shrubbery - it's such a sweet, subtle, green garden space. All those tough shrubs with interesting leaf forms I planted some years ago (and promptly forgot to water) have matured . Of course, any flowers are a bonus, as I'm more than happy to feast on the foliage. There's great variety and contrast in the (mostly) budget shrubs in the Shrubbery. 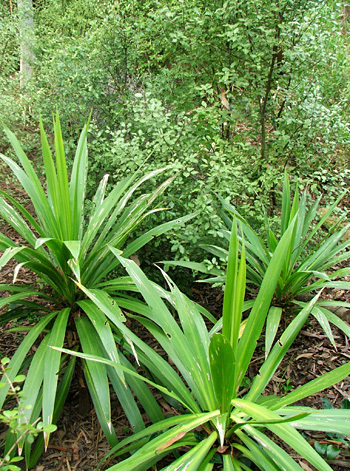 I enjoy the fat Cordyline spikes (with the evocative name Green Goddess) next to the delicate variegations of small Pittosporum leaves. I've got veins on Viburnums, as well as wavy and toothy edges on Olearias. Not to mention all the different shades of green, a garden's most beautiful colour. I've planted low path edgers with interesting leaf shapes, too - clumps of Bergenias, Renga Renga (Rock Lilies), and miniature Agapanthus. Just a couple of rogue roses must have sneaked in when I wasn't looking. 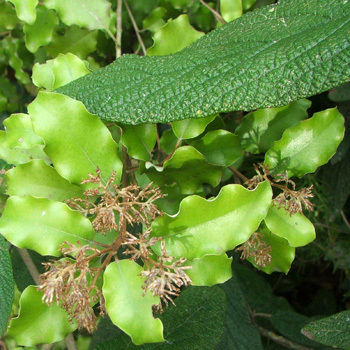 My garden enjoys mild winters, so the native New Zealand shrubs which I love to plant are virtually all evergreen. The only common natives I don't grow in here are Hebes - they grow poorly without sunshine and watering. Not that my Shrubbery is all green - some busy chocolate Coprosmas look gorgeous surrounded by green froth and frills. Cream Delight Phormiums lighten the look with their delightful cream stripes. A mini-mass planting of Choisya ternata (Mexican Orange Blossom) is growing slowly but surely underneath a row of thin gum trees. Choisya shrubs survive planted around many a MacDonald's drive-thru - that's surely proof of tough. And it possibly explains why many refined gardeners won't touch them! I love the Shrubbery's paths which brush past the greenery, and the open airy spaces where I can look up and enjoy the skyline. 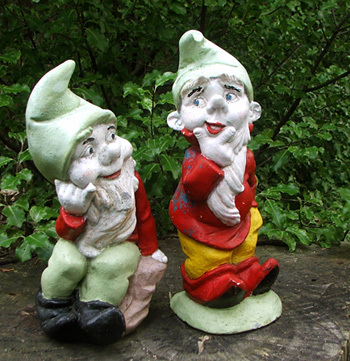 A huge pine tree stump provides a special spot at the moment for a couple of eccentric garden gnomes. Many of the Pittosporums have self-seeded, and I encourage that. They must know, after all, if this is a suitable garden area for them to grow. 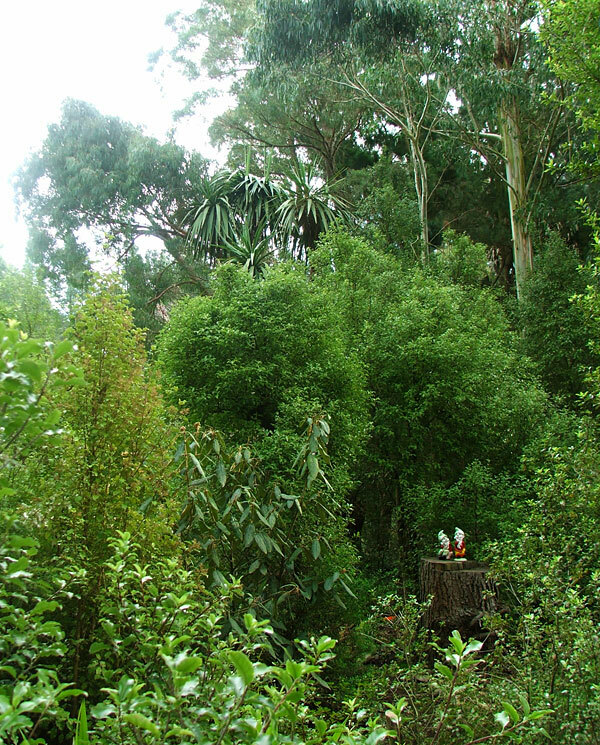 To purchase and plant shrubs underneath towering Eucalyptus trees in dry, sandy soil without irrigation - and stay happy - no plant can cost more than a couple of dollars. If a bargain sadly passes away from difficulties with water, then so be it - my wallet won't weep. In a difficult garden area 'cheap and (possibly) nasty' often translates into 'alive'. So three hearty gardener's cheers for the rough and tough shrubs. They've helped me create a delightful evergreen shrubbery.